Millennials continue to be among the strongest backers of Democratic candidates this fall, though their support for the Democratic Party has slipped since 2008. But young voters have given far less thought to the upcoming elections than have older voters, and this gap is larger than in previous midterms. In a survey last month, conducted among 2,816 registered voters, the Pew Research Center found 50% saying they had given “quite a lot of thought” to this year’s elections. This is little changed from a comparable point in 2006 (48%). In both years, young voters report giving less attention to the election than those age 30 and older, but the gap between younger and older voters this year is double what it was in 2006. Currently, 53% of voters 30 and older are giving a lot of thought to the election, compared with just 31% of young voters — a 22-point gap. In 2006, there was an 11-point difference; 50% of voters 30 and older, and 39% of those younger than age 30, were giving a lot of thought to the election. 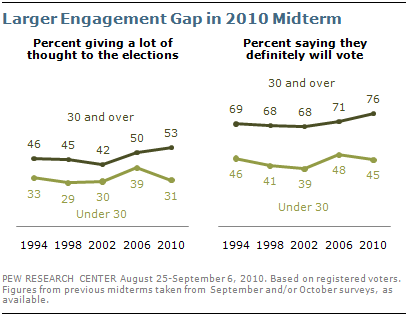 Similarly, there is a substantial age difference on another key measure of engagement — certainty about voting. Currently, 45% of voters under age 30 say they definitely will vote in this year’s elections, compared with 76% of voters ages 30 and older — a 31-point gap. In 2006, the gap was 23 points (48% vs. 71%). The proportion of voters 30 and older saying they definitely will vote is higher this year than in any of the previous four midterm elections. By comparison, the percentage of young voters saying they definitely will vote is about the same as in previous midterms. These shifts are particularly noteworthy when party identification is taken into account. Just 27% of young voters who identify with or lean toward the Democratic Party have given a lot of thought to this election, down from 47% four years ago. Among older Democrats, there also has been a decline, from 53% in 2006 to 43% today. The current levels of interest among younger and older Democratic voters are fairly typical for a midterm election; in 2006, interest among both groups was particularly high. Overall, Republican and Republican-leaning voters are far more enthusiastic this fall than in any of the last four midterms. Fully two-thirds (67%) of Republican voters age 30 and older say they have given a lot of thought to the election, which is much higher than in recent midterm elections, including in 1994 when Republicans won control of Congress (53% in the fall of 1994). 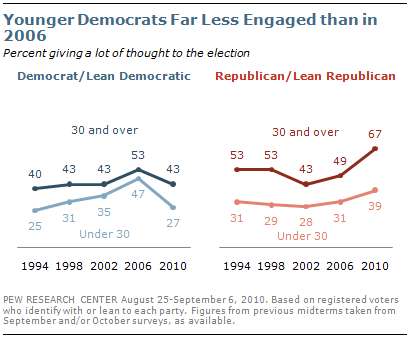 Young Republicans continue to be less engaged than older Republicans. The low level of engagement among young Democratic voters this year weakens the impact of what has historically been one of the party’s strongest voting blocs. In September, Democrats led by a 54%-to-37% margin among registered voters younger than 30, but ran even with Republicans among voters in older age groups. When the sample is limited to those most likely to vote this fall, the 17-point Democratic advantage among young registered voters becomes a divided race among likely voters under age 30 (51% to 47%). The Millennial generation has been the Democratic Party’s strongest age group in three consecutive election cycles, giving a majority of its support to Democrat John Kerry in 2004, Democratic congressional candidates in 2006 and Barack Obama in 2008. During 2008, the Democratic Party enjoyed a 32-point advantage over the Republican Party in partisan affiliation and leaning among Millennials (62% vs. 30%). During the past two years, however, the Democratic advantage has narrowed considerably among young voters, as it has among older voters. 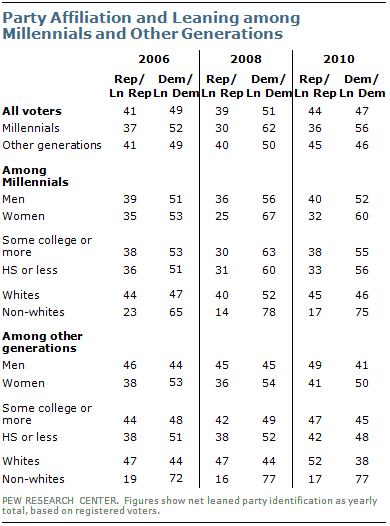 In polling conducted in 2010, 56% of Millennials identify as or lean Democratic; 36% identify as or lean Republican. Among older generations, 46% identify with the Democratic Party or lean Democratic, while 45% identify as or lean Republican; in 2008, the Democrats had a 10-point lead among older age groups (50% to 40%). 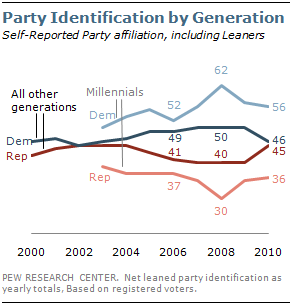 Most of the demographic differences in party affiliation seen among voters overall are evident among Millennials. Young women are significantly more Democratic than young men; 60% of Millennial women are Democratic, compared with 52% of Millennial men. Among older generations, 50% of women are Democrats compared with 41% of men. Among white Millennials, party affiliation is nearly evenly divided (46% Democratic, 45% Republican). Among non-white Millennials, the Democratic Party enjoys an overwhelming 75%-to-17% advantage, nearly as large as in 2008 (when it was 78% to 14%). The Republican Party now has a substantial lead in partisan affiliation among white voters age 30 and older (52% to 38%). In 2008 and 2006, older white voters were divided in party identification, though they leaned Republican. The Democratic Party retains an overwhelming lead among non-white voters 30 and older (77% to 17%). 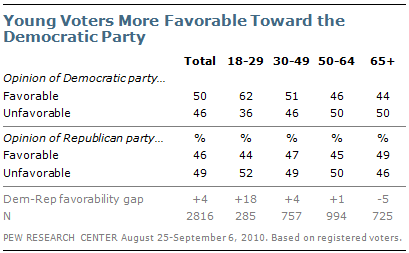 As with party affiliation, young voters continue to have more favorable opinions of the Democratic Party than do older voters. But they are not especially negative in their views of the Republican Party. Overall, half of registered voters (50%) have a favorable opinion of the Democratic Party, but 62% of those ages 18 to 29 do so. By comparison, 51% of those 30-49, 46% of those 50-64, and just 44% of voters age 65 and older view the Democratic Party favorably. The Republican Party’s image among voters overall is not much different: 46% have a favorable opinion and 49% an unfavorable opinion. But age differences are much more muted: 44% of young voters are favorable to the GOP, compared with 47% among those 30-49, 45% among those 50-64, and 49% among voters 65 and older. Barack Obama’s job approval rating, currently at 46% among all registered voters, has fallen substantially since the start of his presidency, across all age groups, Millennials included. 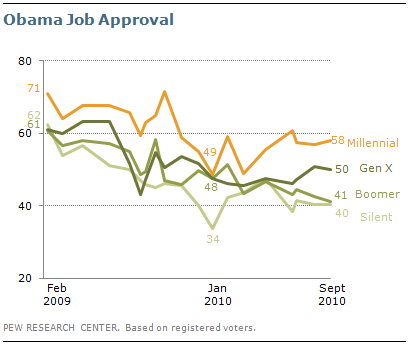 In September, 58% of voters younger than 30 approved of Obama’s job performance, down from 71% in February 2009. 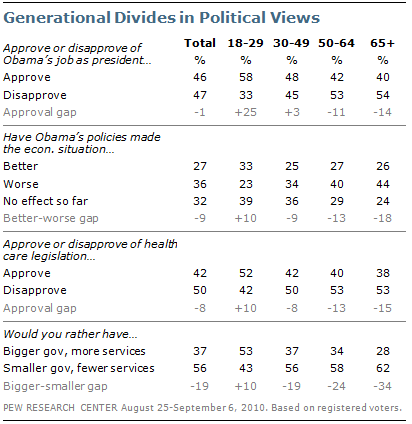 Yet younger voters remain far more supportive of Obama than any other age group. On balance, far more Millennials continue to approve (58%) than disapprove (33%) of the job he is doing. By comparison, voters ages 30 to 49 are divided in their assessments of Obama, and a clear majority of those age 50 and older disapprove of the job Obama is doing. Only about a quarter (23%) of young voters say Obama’s economic policies have made conditions worse — the lowest percentage in any age group. And voters under 30 are the only group that tends to approve of the health care legislation passed earlier this year. These views are not solely based on an affinity for Obama personally. Millennials, as a generation, have consistently expressed more liberal, pro-government values than have older generations. As documented in the Pew Research Center’s comprehensive look at this generation earlier this year (“The Millennials: Confident. Connected. Open to Change,” Feb. 24, 2010). Millennials, in addition to being more socially liberal, tend to see government as more effective than older generations. While they are not necessarily more supportive than their elders of broad social safety net programs, they are substantially more supportive of government regulation, affirmative action and less likely to accuse the government of being wasteful and inefficient. In this regard, Millennials are the only age group in which more voters prefer a bigger government providing more services than a smaller government providing fewer services. Another characteristic of younger voters today is their upbeat outlook in tough economic times. Roughly half (51%) of voters younger than 30 say they have experienced joblessness in their household within the past year, compared with 42% of those ages 30 to 64. Yet younger voters are far less dissatisfied with the way things are going in the country than their elders. Just over half (55%) of voters younger than 30 say they are dissatisfied with national conditions, compared with 77% of voters age 30 and older. 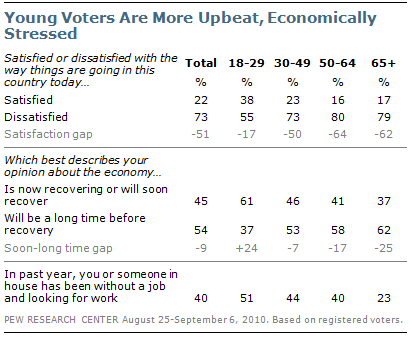 More strikingly, most young voters are optimistic about the economy, while most voters 30 and older are pessimistic. Roughly six-in-ten (61%) young voters believe the economy is either already recovering or will recover soon — just 37% believe it will be a long time before the economy turns around. These figures are nearly the reverse among voters age 30 and older: 42% see an economic recovery in the near term, while 57% believe it will be a long time before the economy turns around.